USP- remote control backlit wall feature and shimmer lacquer. the shimmer comes in glossy and matt both. USP- SS frame which can be combined with any range and finish. Cascade linear, geometrical shapes play a major role. To emphasize the horizontal line, the base and tall unit fronts are encased within an elegant designer-style frame. The cool stainless steel colour of the filigree frame contrasts starkly with the strikingly textured eucalyptus volcano melamine. Together with American star designer Karim Rashid, we have designed a kitchen that combines pioneering and ingenious creativity. Characteristic of it is round natural contours and monolithic elements. Particular features are the elegantly formed fronts that also provide a handler function. They are hand-friendly and accommodating. The rounded fronts are at one with square blocks that appear to provide a seamless transition from the island to the floor. This creates a feeling of space defined by openness, lightness and homeliness. 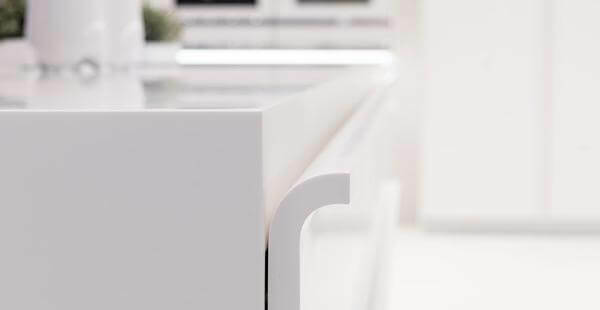 Besides DuPont Corian, rational soft lacquer in a wide range of colours is available as a material for the fronts. 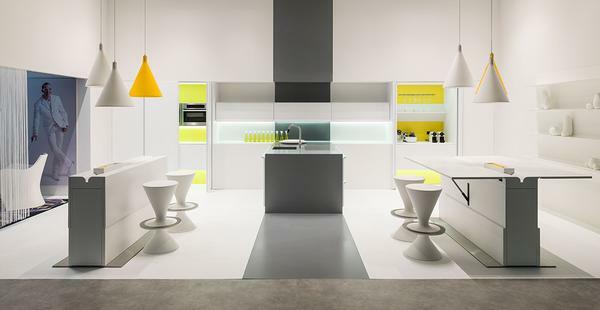 DuPont Corian is also an option for worktops and accessories. Because no other material caters to this design expectation more or is better suited for elegant rounded contours and virtually invisible joints. In this architecturally outstanding handle-less solution, rational uses new side panel steel profiles. 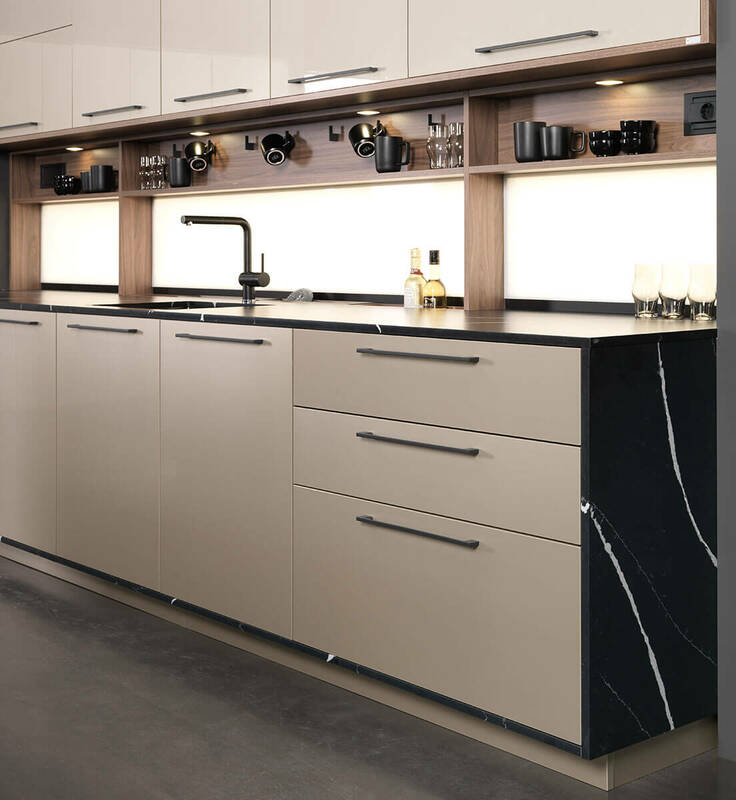 The overall impression is particularly elegant thanks to the finely tuned interplay of high-gloss lacquer and shades of grey. The shelving, for example, presents itself in an elegant platinum grey, the worktop decor in concrete-look. Concrete, a cool-to-the-touch material, once the favourite of purist designers, increasingly influences the appearance of accessory components. 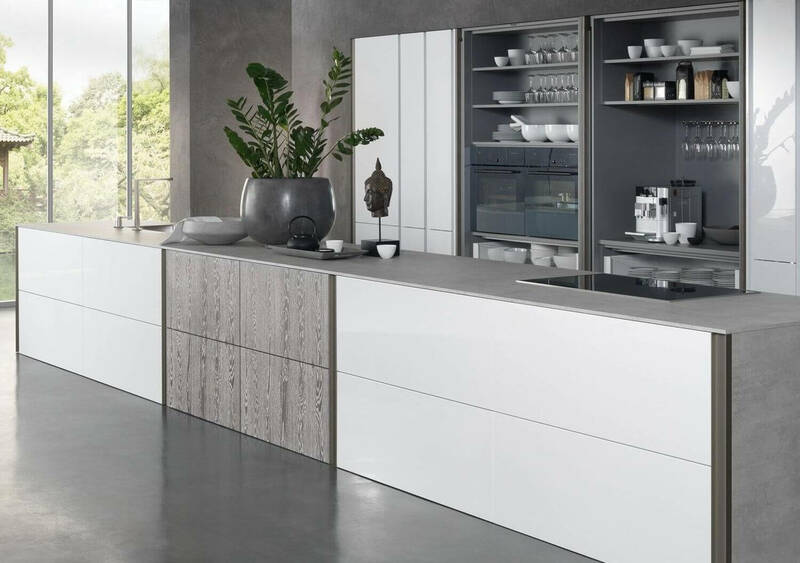 On opening the innovative inwards-sliding pocket doors, a stage for culinary creativity and variety unfolds behind the angled handle-less fronts. Concealed here is more than simply a built-in oven and steam cooker. The Tio zen edition has been packed full of practical features. For instance, the new LEGRABOX together with the AMBIA-LINE inner dividing system offers ample storage space. The CONVOY Centro serves as the ideal larder for the storage of provisions. Additional storage space and user-friendliness are provided by the DISPENSA tall pantry pull-out. Further pleasant surprises, adding value to the kitchen, come in the form of clever accessories, such as cleaningAGENT and the storage marvel cookingAGENT. The former is a pick-up-and-go cleaning pull-out. The lift-out portable caddy serves as a practical organizer for cleaning materials so that they’re always ready to hand wherever needed in the home. Despite its slim dimensions, the flexible fully-extending base pull-out cookingAGENT that can be organized to suit individual needs offers a huge amount of storage space. This intelligent base pull-out for the well-organized cook stores frequently used utensils and ingredients ready to hand. All the storage racks and containers are made of food-safe materials. They can be easily detached, cleaned and repositioned. USP- sleek glass doors with remote control LED lights. The interior can be customised in any finish. The new glass-fronted units appear lightweight and aesthetically appealing. As a design element, these units can be combined with various rational ranges – whether in the modern or traditional segment. Available in trendy brown tinted glass or classic-style corrugated glass, with frames in a burnished finish or coloured agate brown. 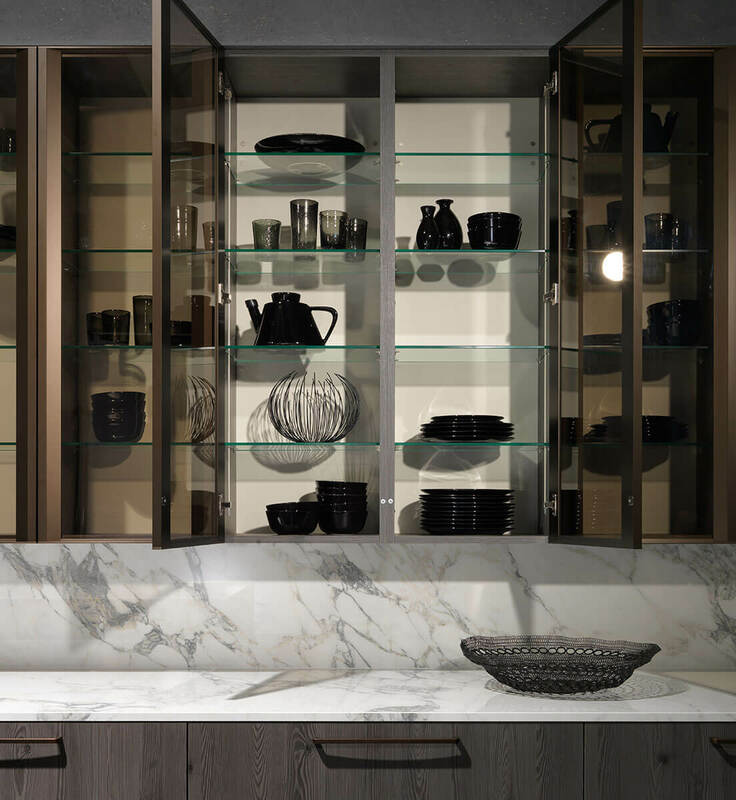 The glass-fronted units are expressively brought into focus in addition by means of the new LED lighting system. It scores highly on account of its wide range of options, such as dimmability, setting of colours and width variability, thus making it easy to configure and accommodate a customer’s‘ wishes.